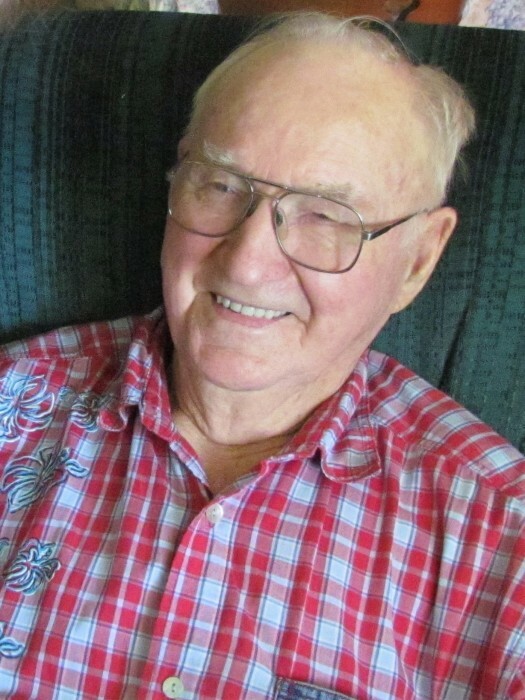 Henry Martin Rose was born on April 9, 1923, in Iowa Falls to his parents Henry Sr. and Mary (Eder) Rose. Henry attended the country school at Hugh’s Crossing and later attended Steamboat Rock High School for his freshman year. He served briefly in the Navy during the end of World War 2 decommissioning ships. He was united in marriage to Elizabeth Frerichs on Oct 13, 1948, at Steamboat Rock Baptist Church in Steamboat Rock. Elizabeth and Henry had three sons Jim, Don, and Gary. Henry worked briefly as a carpenter during the beginning of his farming career for Joe Cervetti and Harry Folkerts. He was a lifelong farmer, farming from when he helped his father all the way into his 90’s. Henry believed in an honest and productive days work; if you hadn’t done something productive, you hadn’t done anything that day. He used his carpenter skills throughout his farming career, building his house and helping to build his grandson’s. Henry remarried after the passing of Elizabeth in 1986 to Iva (Campbell) Gast on Dec 19, 1987, at Honey Creek New Providence Friends Church. They resided in Eldora until her passing on Jan 25, 2014. Henry enjoyed spending his time with his family. He was a lifelong member of the Steamboat Rock Baptist Church and served on many different positions and committees. Henry believed in helping others and had a heart for missions and missionaries. He enjoyed traveling to many destinations and wintered in Texas for 30 years. Henry enjoyed playing pinochle, cribbage, dominos, and skipbo with family and friends, especially the grandchildren. Henry is survived by his sons: Jim (Cathy) Rose of Steamboat Rock, Don (Connie) Rose of Owasa, and Gary (Becky) Rose of Whitten; 10 grandchildren: Chad (Jenn) Rose of Steamboat Rock, Caryn McMartin of Grundy Center, Matt (Lacy) Rose of Wellsburg, Sarah (Karl) Sneath of Salina, KS, Jonathan (Rachel) Rose of Whitewater, WI, Tim Rose of Boulder, CO, Lydia Rose of Cedar Falls, Esther Rose of Owasa, Emily (Jacob) Lloyd of Waukesha, WI, and Hannah (Dustin) Van Wyk of Watertown, WI; 20 great grandchildren; sisters Margaret Luiken, Ruth Freeman of Eldora, and Kathryn Trupp of Ozark, MO. He was preceded in death by his parents, wives Elizabeth and Iva, brother John Rose, granddaughter Christa Kay Rose, and grandson-in-law Clint McMartin.